The United Nations Global Compact (UNGC) calls for businesses to work toward achieving sustainable growth by exercising responsible and creative leadership, and encouraging corporate initiatives to support this. Sojitz has endorsed this Compact first joined the UNGC in April 2009. We have since worked to put its Ten Principles into practice. The United Nations Global Compact was advocated by former UN Secretary General Kofi Annan at the World Economic Forum in Davos on January 31, 1999. The companies that signed the UN Global Compact agree with the 10 CSR principles and continually work to promote them. Anti-Corruption Principle 10 : Businesses should work against corruption in all its forms, including extortion and bribery. Sojitz is a member of the Supply Chain Working group, Human Rights Due Diligence Working group, Anti‐corruption Working group, the Environmental Management Working group, SRI/ESG Working group, SDGs Working group and WEPs Working group of the Global Compact Network Japan, an organization which consists of UNGC member companies. Working group members from a wide range of industries discuss case studies and their own examples and carry out measures to address issues based on experience. We incorporate the knowledge and information we gain through working group activities into the Sojitz Group’s CSR initiatives. 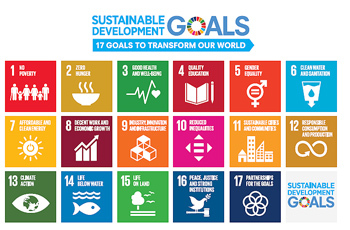 The Sustainable Development Goals (SDGs) call for the resolution of 17 worldwide priority social issues by 2030. Under the leadership of the United Nations, the goals were adopted in 2015 by 193 member nations. Given the medium-to-long-term expectations stakeholders have for the resolution of these issues, the Sojitz Group’s Key Sustainability Issues (Materiality) were established with reference to the SDGs. Sojitz is a member of Sedex, an online system where we register our corporate information which meets international standards, covering labor, health and safety, the environment, and business ethics, as we strive to build socially responsible supply chains. Sedex is an information sharing platform run by Sedex Information Exchange Limited, an NPO with headquarters in London, which conducts an internationally standardized survey of suppliers around the world on the environment, society, and human rights. Through an online system, members are able to share answers to these surveys and the results of audits. While reducing the burden on both suppliers and contractors through use of this system, the company is striving for the implementation of ethical and responsible business practices in supply chains on a global level.